The chart below shows a quick summary of the differences in the two modes. If a device in server mode loses connection and then reconnects to the server, it will continue to upload the logs based on the last log index that was sent to the server before it lost connection. Hence no logs are lost. 1. Go to DEVICE > Network. 2. Set Server to Use. 3. Enter the IP address of the Server. 4. Check Time Sync with Server if all devices are in the same timezone. This will avoid wrong punch logs which may occur with devices with different times. This feature synchronizes the time of the device if there is more than 1 minute difference with the server. Devices directly under the Server tree are in server mode. Devices under the device tree are in direct mode. Note: 2.x devices (A2, BioStation 2 etc.) will appear below the server tree regardless of connection type. 2. 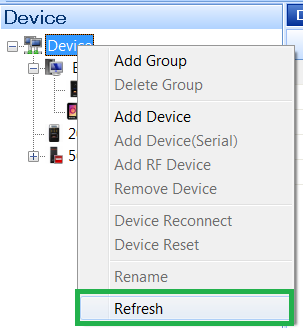 Right click on the device tree and click Refresh. 3. If the device fails to appear on the server tree after refreshing, check if you can ping the device. 5. 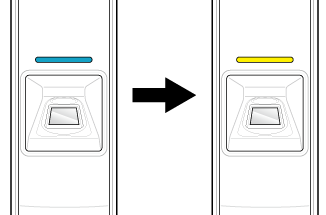 If the device is showing a Blue / Yellow LED, it means that it hasn’t received an IP. Check your DHCP server. 6. If you have trouble finding the device with BioStar, you can use BioStar Config to search and change the network setting of the device. Note: The manual is included in the zip file. 7. If you cannot search with BioStar Config either, try resetting the device network settings to default. Instructions on how to set it to default is included in the device manual.